Are you considering a straighter smile? If you’ve been avoiding aligning your teeth because of the appearance and hassle of traditional braces, this is a great option for you. 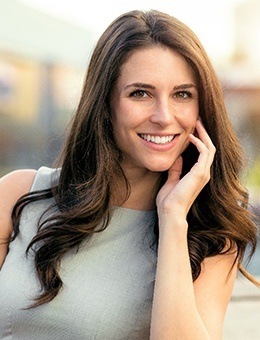 At Murphy Family Dentistry, we offer Invisalign treatment to give our patients a more discreet and comfortable way to receive the smile of their dreams. Dr. Jacquie Nguyen and Dr. Masoud Najari have additional training in orthodontics and Invisalign to provide you with quality treatment. Keep reading to learn about Invisalign in Murphy and the benefits that you’ll receive from clear braces. Invisalign treatment involves the use of a series of clear plastic aligning trays that are made to gradually shift your teeth into place. Dr. Nguyen or Dr. Najari will examine your smile and then take special images and impressions of your teeth to create your custom-made aligners. You’ll wear each aligner for about 2 weeks before switching to the next one in the series. You will wear your aligners between 20 and 22 hours a day, only removing them to eat and maintain oral healthcare. Treatment time will typically take between 10 and 18 months. 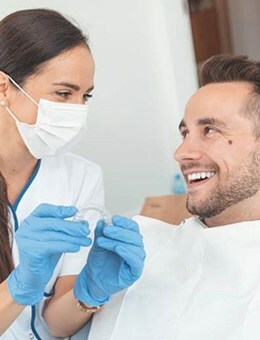 Once your teeth are completely aligned, we will give you a retainer to wear to ensure that your teeth are permanently shifted into their new position. 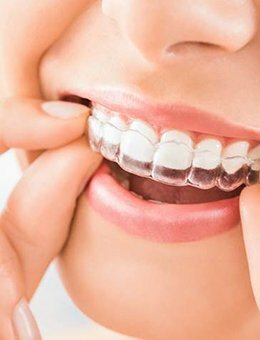 Invisalign aligners come with many benefits, but primarily they give you a way to straighten your teeth without anyone noticing. The clear plastic design allows you to navigate through your personal and professional lives with confidence. And, because the aligners are made with smooth plastic, they’re incredibly comfortable to wear and easy to talk with. This also means that you won’t have to worry about brackets and wires cutting or catching the inside of your mouth. Additionally, Invisalign clear braces are completely removeable, allowing for you to eat all of your favorite foods without worrying about damaging your braces. Just make sure to brush your teeth and rinse out your aligners before putting them back in your mouth. Lastly, Invisalign’s treatment time is typically shorter than traditional orthodontics. Treatment with braces usually takes at least 2 years, whereas the Invisalign process can be completed in as little as 10 months. 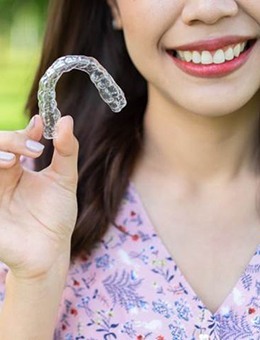 The cost of your Invisalign treatment will vary based on the severity of your misalignment, how committed you are to wearing your aligners, and other variables in relation to your oral health. The best way to receive a precise estimate is to schedule an appointment with one of our dentists. They will evaluate your smile, your oral health, and the degree of your misalignment to give you a fair estimate. If you’re interested in receiving Invisalign clear braces, contact our office today to get started.